This is the same machine as our G1029Z2, but with the hugely popular Polar Bear color scheme. 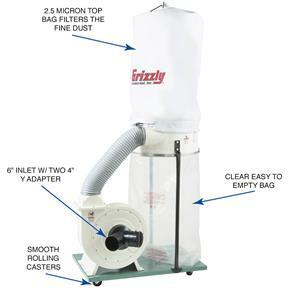 It features a 2.5 micron top bag to capture the fine dust particles that normally end up all over your shop. We buy these machines in huge quantities—with no middleman—so we can pass the savings on to you.CSA certified meeting CSA C22.2 No 243-M91 and UL 1017-4th standards! Portable base size: 21-1/4" x 33-1/2"
Bag size (dia. x depth): 19-1/2" x 33"
Approximate shipping weight: 122 lbs. Bought this machine in March 2019. Set up was easy and portability is great. 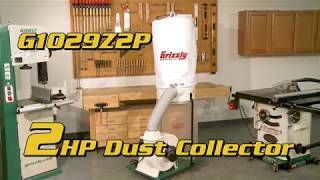 The dust collection is such an improvement to my Shop Vac, I am looking forward to dusting down my shop as often as I have been in the past. The remote switch I installed makes this machine so convenient to use, and the noise level is less than I anticipated. Overall this is a great addition to my shop. Added a longranger iii remote and cyclone and it works great from all machines, anywhere in or around my shop. I purchased this item in Dec. 2018 and am completely pleased with my new dust collector. Unlike some of the other reviews my dust collector was packaged well with plenty of protective Styrofoam and cardboard. 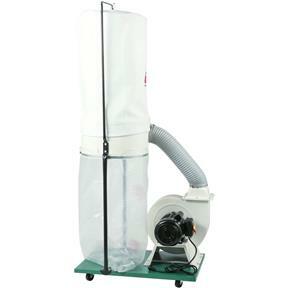 As expected, noisy but not as noisy as my previous Reliant brand dust collector. The aluminum impeller especially looks very well made. Product arrived on time. I would definitely buy from Grizzly again. the plastic bottom bag it is very hard to put on - think I will go back to using the cloth one from the old unit. I have not got it all set up yet. My only complaint is you are lucky the machine was not damaged. The box was crushed and noted upon delivery. Much of the packing was also crushed. survived without damage. Good product, poor packing and shipping. Don't know how I got along without it. Smart investment. Experience was not pleasant although looks to be equal to former unit which I had for 17 years. MAJOR PROBLEM is Poor protective packaging which resulted in extensive damage to some parts and also the replacement parts. Freight carriers do not care if they use a fork lift on an item that is not on a pallet! I was considering on getting a table saw in the future but do not want to go through the same "damage and repair" as I did with this order. I recently bought a DeWalt Planer and packaging was twice as good as your dust collector. On the positive side, the staff I worked with at Grizzly was always helpful and caring to resolve the issues that stemmed from the "poor protective packaging." Great product, really moves the dust and debris away from the saw. It is not as loud as I thought it would be. I will sometimes just let it run while prepping for the next project. This was a step up from a shop vac setup and I am very impressed. I have it hooked up to my SawStop and Dewalt planer so far and the power this thing has is amazing. This product arrive damaged with one of the flanges joining parts bent flat against the main piece. The box was in good shape and it was not apparent that there was any damage until it was unboxed and getting assembled. The bent part was able to be be straightened and the gasket joining the two mating surfaces was able to make an adequate seal. The inexpensive (read cheap) packaging material was the cause. The material is totally inadequate to protect the product based on the weight. Better packing material could have prevented and even thicker packaging at the point where the damage occurred. My guess is that the packaging was never validated to demonstrat effectiveness in protecting the product during shipping. Works fine and am very happy with the performance. The first time I used this on my planer it cloged at the entrance just past the "Y" joint. Other than that it works great. The unit went together easy. I have already filled one bag. The one thing I am not fond of is that you only get one bag and it is a bit of a challenge to mount the bag. 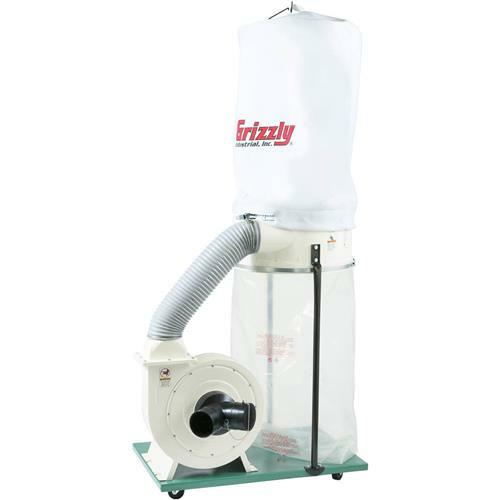 I have read through a lot of reviews on Grizzly and just about every other brand and they all seem to have issues mounting the garbage bag. Mine did come with the two stage separate trash can lid which I have not set up yet. 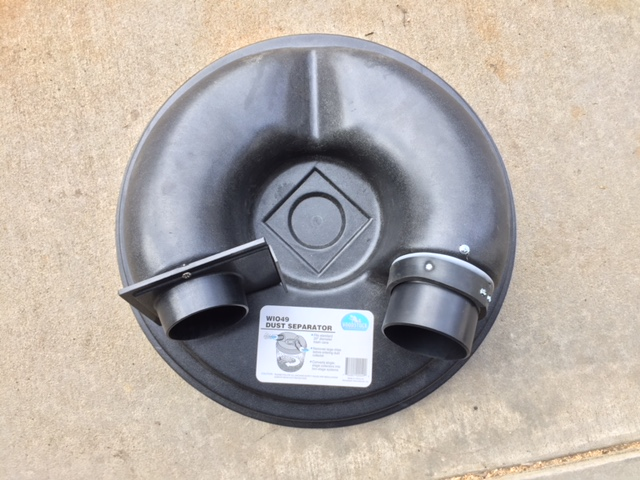 I've connected this to a 4" thin walled, white, drain pipe ducting that runs 10' up the wall, 25' across/above the ceiling (in the attic) then has a port hanging down in the middle of my shop with a 4" and a 2 1/2" Y connector (ITEM# T20559; 4" x 4" x 2-1/2" Y-Fitting) and hoses. It came with the 30 Gallon Dust Collection 2 Stage Separator. I've also installed blast gate ports on the hoses and back at the separator to give me options. There is no problem running both hoses open as I have several pieces that I run both a 2 1/2" and the 4" vacuum hoses at the same time. 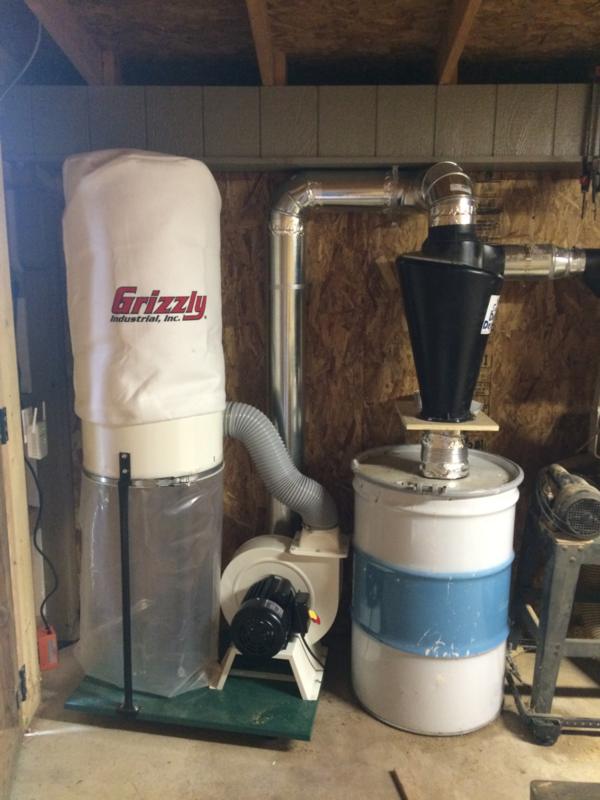 The Separator is pretty much a "must have" as it saves on filling up the plastic bag on the dust collector and makes it much easier to empty the wood shavings....only the fine dust gets on into the plastic bag. 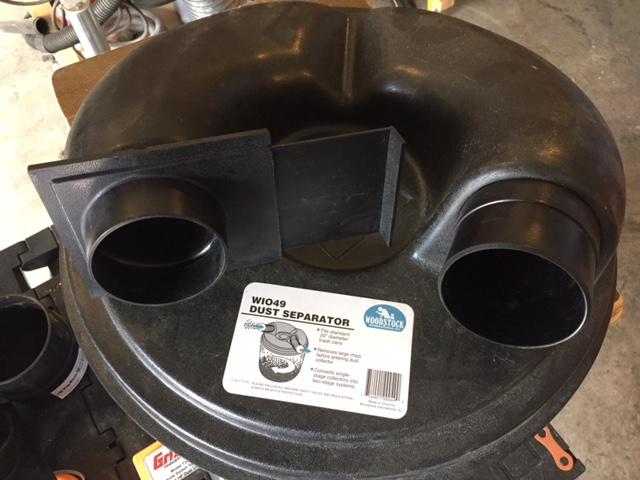 Others have commented that the separator lacks a great deal when it comes to attaching hoses and sealing to a trash can. I have attached pictures of how I adapted connectors to the separator. 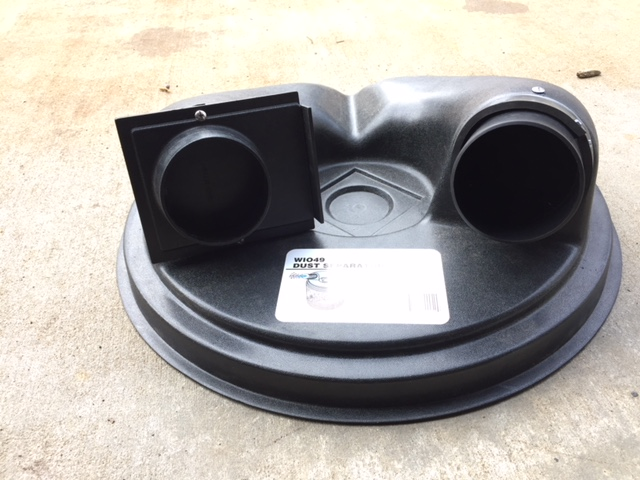 I also put a soft sponge rubber gasket under the separator where it contacts the lip of the trash can and hold the lid down with a bungee cord extended from one trash can handle to the other over the top of the separator (don't really need bungee as the suction pulls the lid down tight). The hose connections are a 4" blast gate on one and a 4" hose to 4" hose connector on the other. I simply put a rubber tube gasket material around where the blast gate/hose to hose connector contact the separator holes, applied a strip of rubber strapping to the hose to hose connector in front of the gasket to give it something to push the gasket against the separator. The rubber strip wasn't needed on the blast gate side as it has a large flange that functions to push the gasket against the separator. 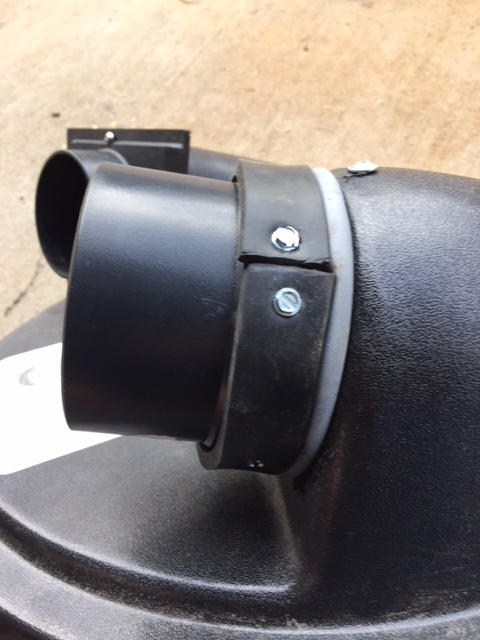 A 1/4" self tapping screw (I pre-drilled just in case to avoid cracking/splits) was used to secure the blast gate to the face of the separator opening and from the top on the hose to hose connector side. You could just as easily use a blast gate for both...like all dust collection system descriptions, you have to figure out what pieces you need to connect the pieces you want to use...and we all end up with extra "pieces" after we are done! Hopefully the pictures help explain the verbiage above. 1) connectors in place before adding gaskets; 2) gasket on blast gate; 3) side view of hose to hose piece installed with gasket and rubber "bumper" strip; 4) front view of same; 5) finished , front view; 6) finished, top view. Went together smoothly, and does the job as intended. The switch is in an inconvenient location, but we resolved that by placing an outlet on a switch on the wall above the unit. It works great, wish I would have bought it a long time ago. Bought for my son at Christmas as he is just starting out and was describing the mess he was creating with table saw, joiner, and planer. Just the ticket and both he and his wife love it. Great price and value. Our engraving company needed a powerful extraction of laser fumes from a production Engraving Laser. The first unit we bought was good for one machine. 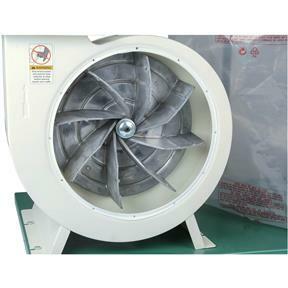 We then bought a MONGO Size unit that needed a lot of CFM draw. 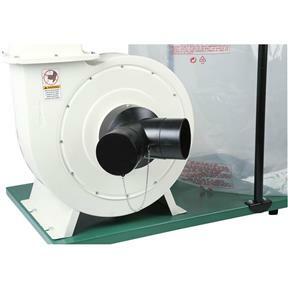 Not able to purchase just the blower this time it was still a better deal to get the whole dust collector and recycle the the frame and bags. The blower is set up to remote start and is not affected from the heat or minus degree cold from sitting outside in a cinder block house. I was going to buy a less powerful unit from another manufacturer. I'm glad I went with Grizzle good customer service. This macine is a beast and really helps keep my shop clean. I've had this unit about a month now and have just started to build a shop around it. It is an amazing piece of machinery. I has performed above my expectation up to this point and the noise level is quite tolerable. Great Product for the small shop owner/operator. It is not completely installed yet but the product is great and the customer service and shipping was flawless. Looks like a winner all the way around. I bought this model with the 2.5 micron cloth filter to replace my old one with the canister type filter. The canister was leaking dust into my shop. I am waiting to see how good the bag filter works. Assembled easily and has a lot of power. We used a 4" metal accordion style dryer vent to attach to our saw table and it pulls so hard it slightly collapses the thin wall aluminum material. It is working very well, only thing I would like to see is a metal drum in place of the plastic bags; other than that very satisfied so far. I have some lumber to plane and this dust collector will clean up the mess. Easy to assemble. I really had to talk myself into getting this collector. Not because of it's price or anything, but because I thought I could live without one for a while and decide later down the road. Well let me tell you, I am EXTREMELY glad I purchased it! Lot's of power! I mean a lot! For now here's one example: I used a 4" hose held about 3" below and 3-4" away from a router on a Dovetail jig and I watched all the sawdust and shaving literally bend in the air and get scooped up by the power of this suction! Nothing, and I mean nothing, made it past this suction hose while using the router. And this was a sloppy, wire held setup just to see what would happen. Prior to that my first router cut buried the front of me and the floor in shavings and dust! More review to come on this one. 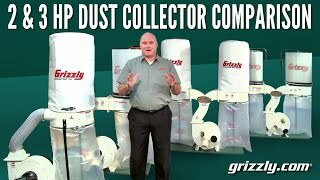 Don't be sitting on the fence if you are deciding if you want a dust collector like this. If you can afford it (no credit - go cash - advice), DO IT!! Hooked up the 2 stage separator that came with the dust collector. Works better than anticipated. All the chips from the planer go in the garbage can. Very little finds its way into the dust collector bag. Should only have to empty the bag about once a year. Very Nice. I am very satisfied with this product. I would recommend it for anyone's shop. I had to rebalance the impeller and reset the motor fan. They were rubbing on the housing. 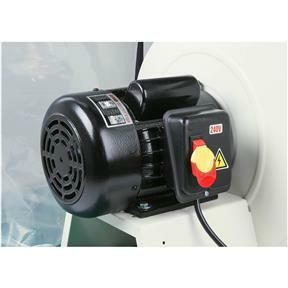 The motor fan is mounted without a keyway and has to be repeatedly re tightened. Cheep engineering. I bought this system to go with my new G0691 cabinet saw. It works perfectly for the saw, however, I have incorporated a whole shop vac system into my new facility. The only problem with this system is when larger shavings come into play. Specifically planer . I had several clogs and located the culprit to the "guard" at the infeed of the impeller. I probably voided the warranty but once I removed this cage like structure, no more clogging. I have no idea why the engineers would intentionally put an obstacle inside the system but once removed, it works great. Purchased this unit along with my new Grizzly saw as I needed a more powerful dust unit. It does the job perfectly although it is a bit noisy. Easy to set up and use. Works well no problem picking up dust. Dust collector working great! I'm very pleased with the product.